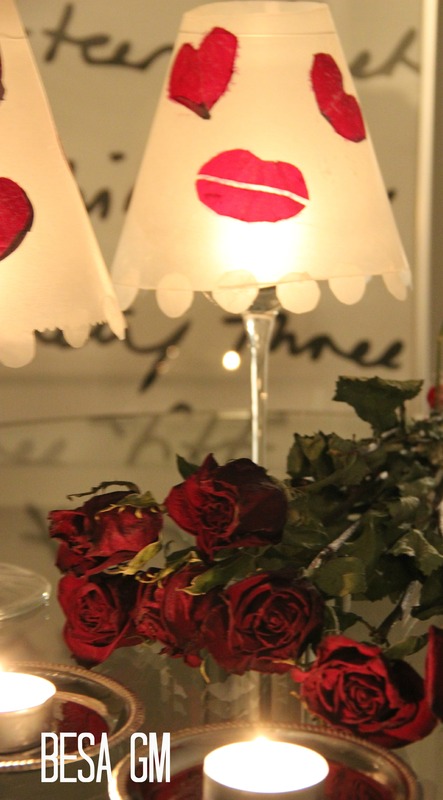 With Valentine’s Day approaching, some of you may have already started thinking about what to buy or create for your loved ones for the Valentine’s, or what to incorporate in your home decor which would reflect the Valentine’s Day mood. Until yesterday, I did not think about any of the above. 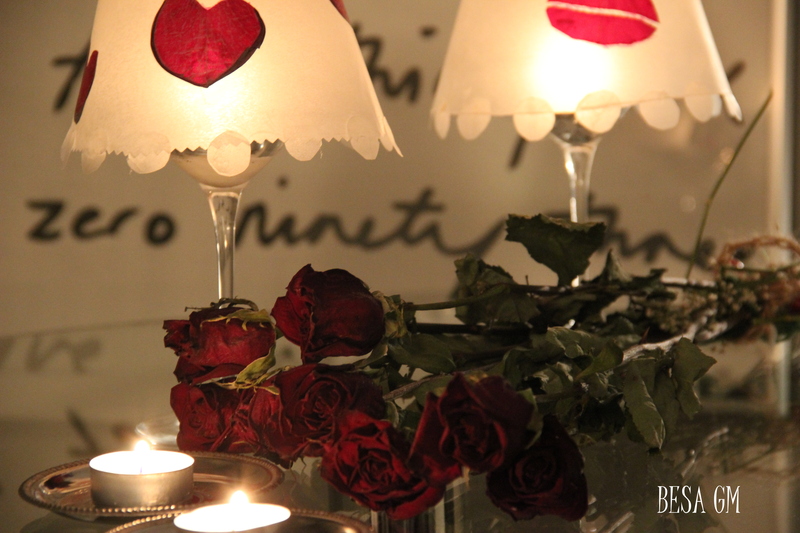 However, I created something really simple and lovely for that day. 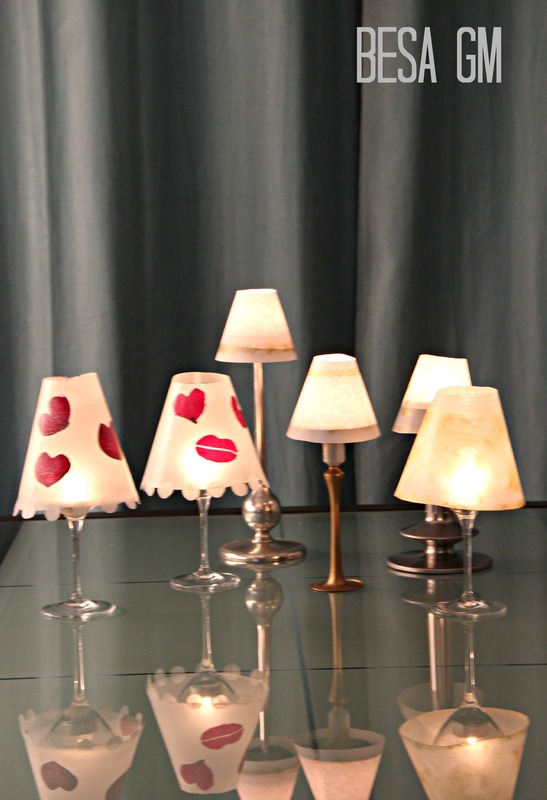 While checking my pinterest boards for a paint color for an undergoing project, I came across a pin featuring beautiful mini wine glass candle lampshades. 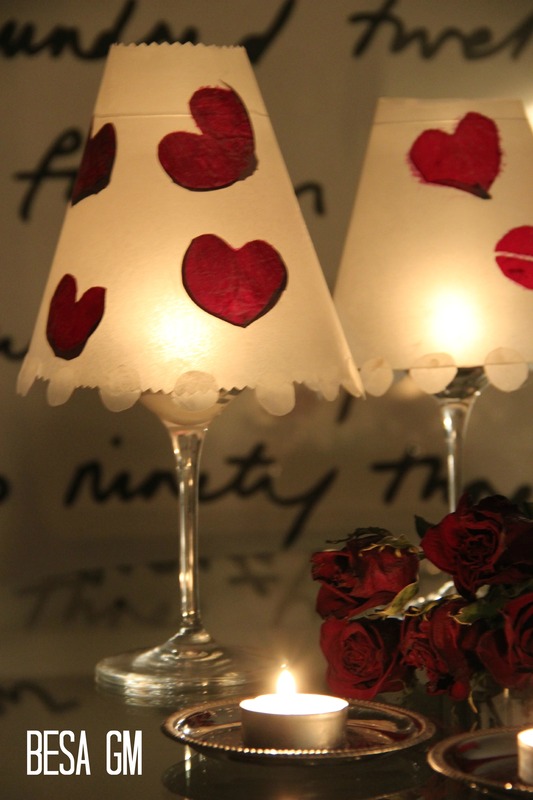 After seeing the pin, and knowing that nothing sets the mood like candlelight, I immediately pictured these wine glass candle shades decorating my diner table for the Valentines. Since the project seemed so easy I wanted to get it going immediately. I downloaded and printed the shade pattern from here. My wine glasses are bigger than usual, so I had to adjust the pattern and make a larger one by adding an inch on the sides and an inch to the bottom of the original pattern. 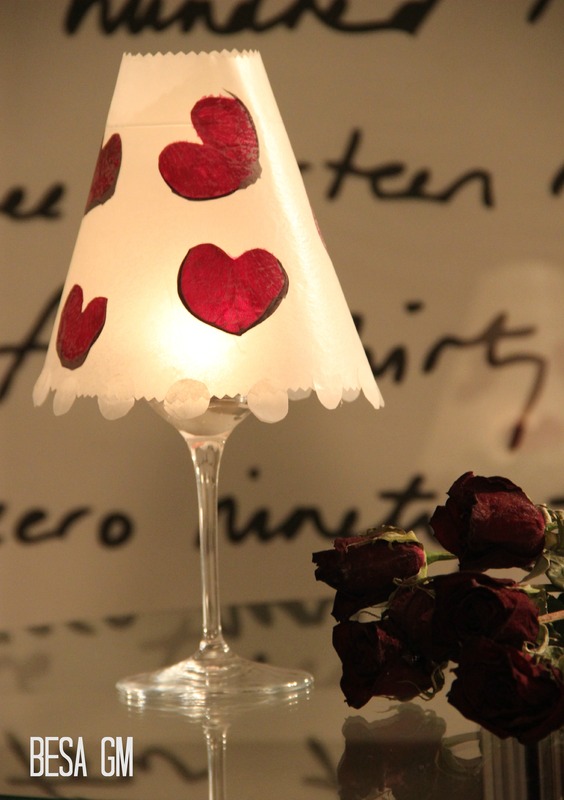 Candlelight glowing through translucent paper is more appealing to the eye but I did not have that kind of paper to use in this project so, instead ,I used waxed paper which I use for baking. As seen in the collage above, I laid a sheet of wax paper at a size to fit the pattern at hand. 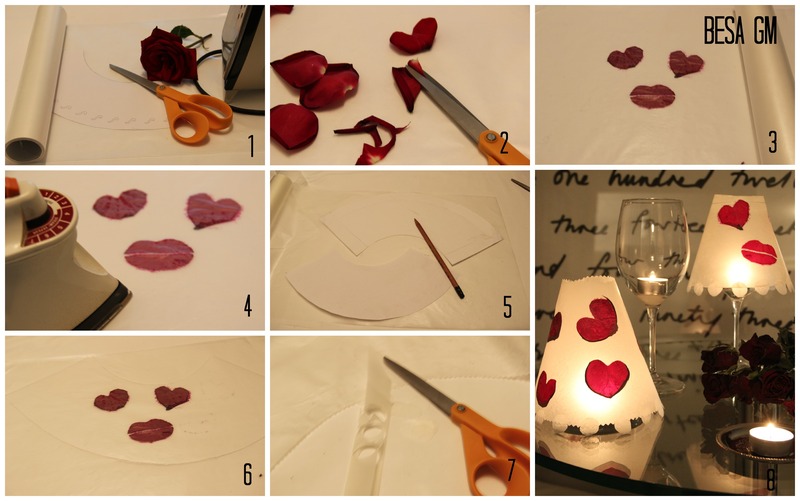 For a “Valentine” touch, I decided to incorporate rose petals into the shades, so i cut each petal into a heart shape and even wasted some petals trying to cut them into lip shape. After waisting a few I finally ended up with a pair of lips which more look like they had undergone un unsuccessful silicone job, but still they will look fun for that day. 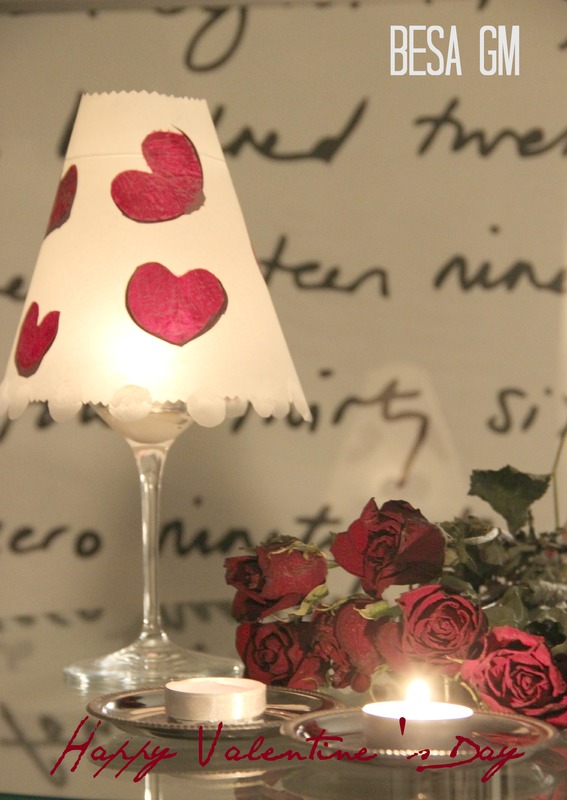 I placed the petals on the laid wax sheet and covered them with another sheet of wax paper. Subsequently, using the iron, in a low setting, I pressed the wax sheets together, and ended up with a perfect translucent paper product. Afterwards, I traced the shade pattern on to the created wax sheet and proceeded with cutting. From the paper remnants I cut some small circles which I added to the bottom of the shades. I applied a thin line of glue to one straight end and wrapped the other end over the glued end adhering them together to form the shade. After finishing the first two, I got carried away and made more shades which I placed them on various candleholders, and they all look nice. 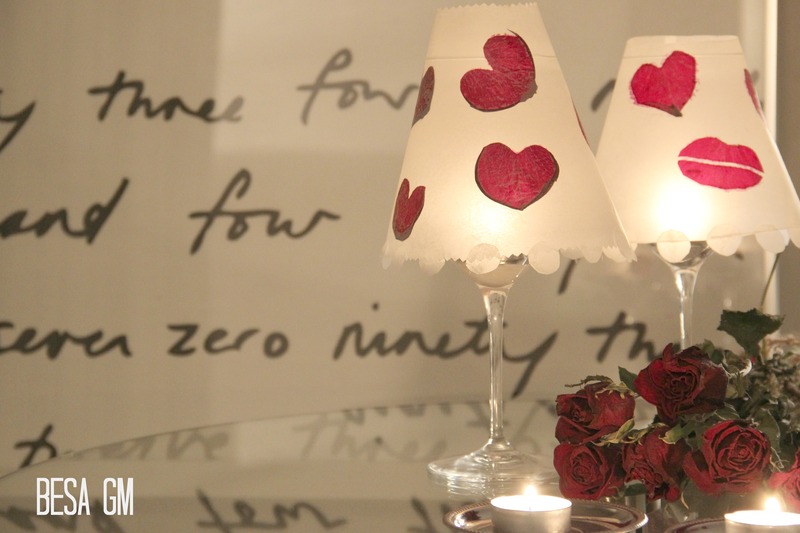 Using wax paper for this project proved to be a good choice as this paper is resistant to heat, so it does not present an immediate fire hazard used together with lit candles. Of course, you should never leave any candle unattended (disclaimer, just in case). Use your imagination for the shade design, as the posibilites are endless, and enjoy making them as much as I did. Happy shade making, and thank you for reading. 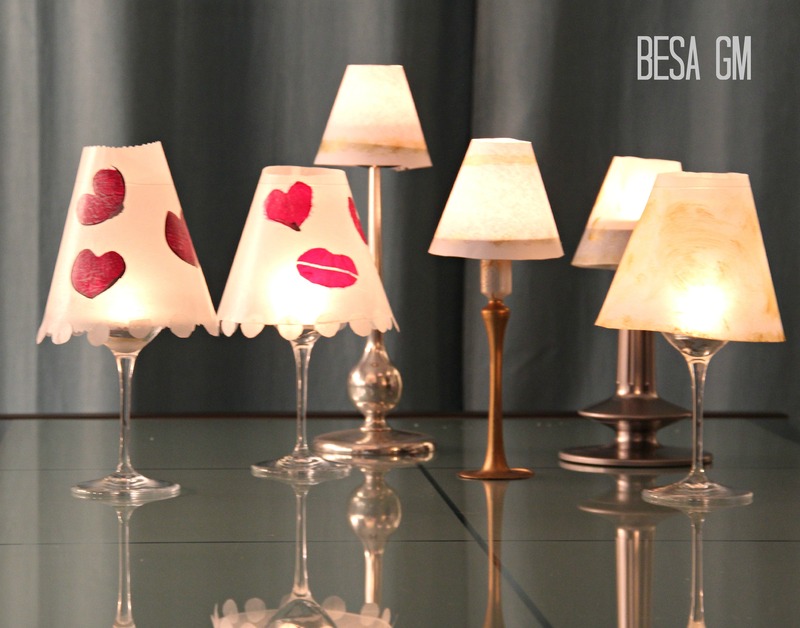 Your lamp shades are adorable. 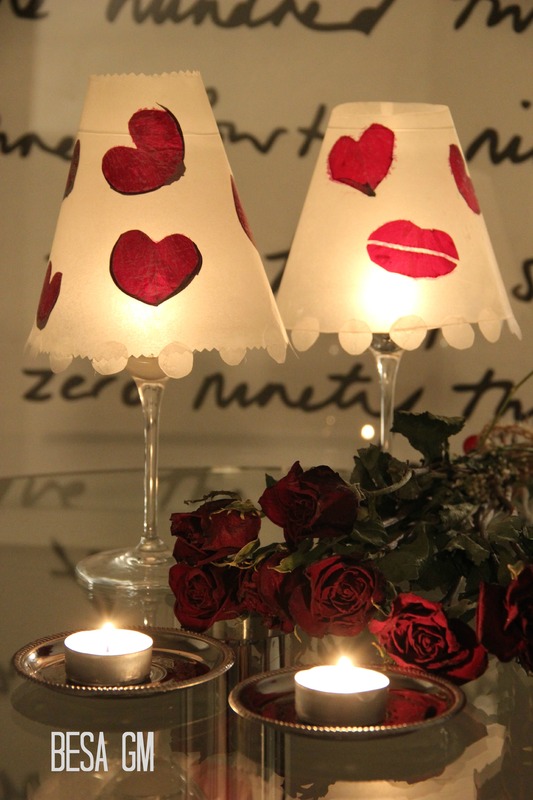 Great idea using the iron wax paper! Thank you so much for the visit and your comment. So cute! What a fun project! Thanks a lot for stopping by and taking time to comment. Thank you for liking this project. I just stopped over by your blog and linked this post. Wow so fun and unique!! Thanks for linking up at Take it on Tuesday!! Thank you for your comment and for hosting the party. Such a cute idea! I love the light shining through. Using the wax paper was a great solution. Thanks for sharing with SYC. I am co hosting Fluster’s Creative Muster Link Party!! Thanks so much for linking up! omg these are adorable! Very very cool!! That’s a wonderful project. But one quick question. Is it safe to burn a tealight candle inside a wine glass. Dosen’t the heat break the glass? I did not encounter any problem using a wine glass with a burning tealight inside. I have Bormioli wine glasses. Hope this helps.THank you for stopping by.